RHS Garden Rosemoor is a garden of two halves. The first, a preserved, real life, family garden extending to eight acres around Rosemoor House, the home of Lady Anne Palmer, who donated her property to the RHS in 1988. The second, a newly created set of gardens within Lady Anne’s 32 acres of pastureland across the road from the house, was developed from 1989. Both are quite wonderful, but for completely different reasons. Oh, those red Crocosmia. We had to drive out this way and every time, despite huge care, I knocked more flowers to the ground. Locals treat them as weeds, but I desparately wanted to look after them! We were lucky enough to be staying at the main house – now divided into holiday cottages – which meant we could roam the gardens after closing time, to our heart’s (very full) content. 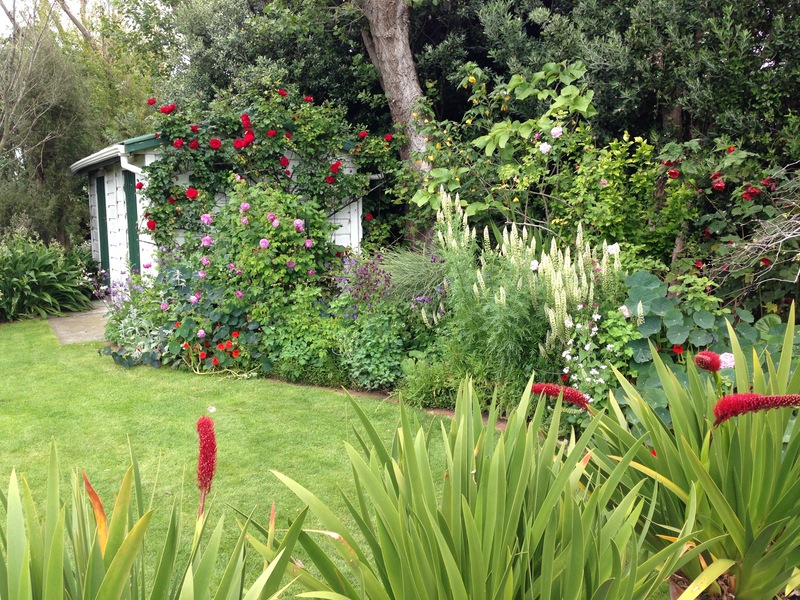 Lady Anne’s garden had a wonderful feel; her presence still felt through her personal style of gardening. You could almost imagine bumping into her round a corner, hoe in one hand, weeds in the other. She had first discovered gardening upon meeting the noted plantsman, Collingwood ‘Cherry’ Ingram, in Spain, whilst recuperating from a bout of the measles. He opened her eyes to the beauty of plants near and far, and it appears she become quite hooked on chasing interesting species around the world. This is reflected more than ever in her Mediterranean and Exotic Gardens but her informal plantings alongside the croquet lawn also provide further insight into the life of the former Earl of Orford’s daughter. The newer garden, developed by the RHS, has a much more regimented feel, not least due to the 13,000 tonnes of soil that were moved to level the site, followed by the planting of 1,200 yew hedging plants to form orderly garden rooms. But what it lacks in history and spontaneity, it goes a long way to make up for with its huge variety of immaculately maintained designs. The map of Rosemoor has a key, starting at A and going all the way to T, each letter denoting a quite separate garden concept. The Hot Garden was at the top of my list to see, the yellows, reds and oranges of so many plants coming to their peak in mid to late summer. I loved the sobering, burgundy beech trees, which complemented the bright flower colours and punctuated the primarily horizontal outlook. The fruit and vegetable garden was also very inspiring; it made me want to rush out and buy some grow-my-own seeds immediately! Of course when I do grow vegetables, I get fed up with all the pests and diseases and their insatiable need for water (not to mention the fact that it’s much easier to reach into the fridge for Waitrose pre-prepared versions at dinner time), but I think we all have to go through this cycle of excitement and failure every few years! 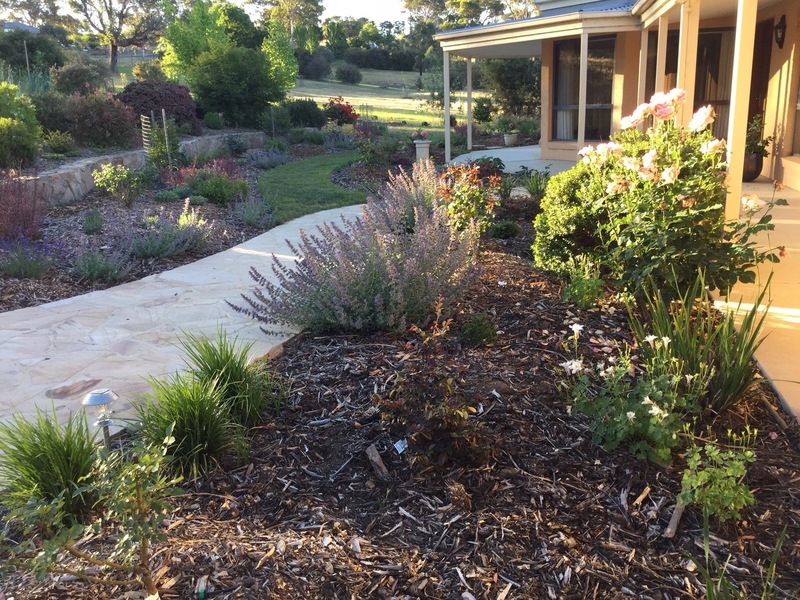 The ‘Foliage and Plantman’s Garden’ also had a definite Australian feel to it, with its muted tones and drought tolerant selections. There was even a Eucalyptus looking perfectly in place amongst its neighbours. It was another good example of using form and texture to create interest in the absence of bright flowers and hues. Some 2,000 roses were planted in 1990; perhaps apt for a garden named ‘Rosemoor’. But despite my love of roses, these were the biggest disappointment of the gardens. I’d be interested to know what you think, but I increasing find roses en masse quite depressing. All bare soil and lanky stems and either boring uniformity or, more often, incohesive randomness. For me, roses are at their best when planted amongst other species: gorgeous, fragrant, bold flowers popping up above generous, dense forms of complementary perennials. Dare I say it, pretty much as the Rose Garden displays at Sissinghurst. I adore a climbing rose embracing an ancient wall as it twists and turns around a downstairs window (yes, Sissinghurst, again!) but rows and rows of shrubs roses? They just don’t do it for me. To the north of the formal gardens, an ornamental lake holds water for irrigation and the natural, large scale planting in this area is beautifully done. But perhaps my favourite of all was the Stream Garden, which I caught in the morning light before anyone else arrived at the garden, with its lush, dense planting, pretty stone focal points and graceful, statuesque trees. This was very definite inspiration for my future garden, which continues to be created and planted in some detail in my head! I love this garden! I love how the paths wind through the gardens. I love the planting and how it falls over the pathways. The only thing I am not partial to and agree with you, is a lot of roses all together. What a lovely place to stay and enjoy at different times of the day. Wasn’t I lucky to be able to go in the quiet parts of the day? I’ve had my eye on staying there for about four years, I should think, so I hope that gives you some optimism for your garden visiting list. The time will come! The paths are lovely aren’t they? I adore informal edges like that too. Thanks for your descriptions of this garden. A place that I would like to see one day. I agree with you about massed roses. Have never liked that look. How lovely to be able to stay in the garden. I’m glad it’s not just me missing something on rose gardens! Of course I should take advantage of the mild, non-humid air here and plant plenty of them, once I get a garden. But I’ll try and apply a bit of imagination too! I agree too Janna – roses need to be mixed with lots of perennials and contrary to poular advice they don’t mind it at all – if you choose your roses carefully (avoiding black spot prone types). I had 250 roses at a previous garden but have ‘pruned’ (s’cuse pun) back to 30 here. They have to earn their keep. I love Rosemoor and hope to visit one day too – the ‘cottage’ stay sounds interesting – I find crowds a little tedious so a great option. Thanks Janna. I’m just confused as to why we see so many pure rose gardens, if we all agree! That is quite a pruning you have had! Assuming (which may be a silly thing to do) that the cultivars you have had most success with would also be the best ones here, you’ll have to share your top 30 list with me sometime. I always find the choice of roses a little overwhelming, but there is most definitely a huge difference between a good rose and a bad rose. I hope you get to Rosemoor one day. The roses at Rosemoor don’t seem to do that well, it becomes even more apparent later in the season. The same for me, I too struggle with roses. Avoiding black spot is more or less impossible and I refuse to be constantly spraying. It’s perhaps not surprising in the damp SW. Probably why the stream garden looks so much better! The first time I read the post I was going to comment that continuous rain might be overstating the case. We were piling down the A30 at the time and then as soon as we turned off at Okehampton the heavens opened! C’est la vie. Yes, I confess I may not have quoted you precisely on the ‘continuous’ rain. I think I was struck by how amazed you were that we had had two days of wonderful weather back to back! We were back down in Dorset with friends this weekend and had another two wonderfully warm and sunny days…to exactly the same reaction of our hosts. Funny that Rosemoor continues to battle with so many roses. Do you think they feel that have to, given its name?! Rose-more. It’s a tough one to get away from isn’t it! Apricot Nectar, Bonica, Heritage, Graham Thomas, Peace, Sutter’s Gold, St Swithun, The Fairy, Sunflare, any of the so called ‘knockout roses’, Ferdinand Pitchard, Valencia, Grus aan Achen, Guy du Maupassant, Mayor of Casterbridge, Monsieur Tillier, A Shropshire Lad, any of the rugosa roses. As my garden (with the 250) would have 20 Of this and 10 of that etcetera, this is about all I can think of, off the top of my head. Some of these May get the odd bit of trouble when stressed but full sun, air flow, and remembering that black spot treatments should be done as a preventative, not a cure (once a rose has black spot it is too late you can’t cure it) but spraying before it appears and after rain (may be a big ask in Devon it seems) can help to prevent problems. The old baking soda spray works as well as any poison. Sprays change the pH of the leaf surface making it less attractive to fungi hence the need to spray before trouble. If like me you can’t be bothered with spray then choosing the right ones is still the best option. The only problems in my current garden are on roses Inherited from previous owner which because they are survivors I hate to pull out. Bonica and Heritage along with Rosarie de la Hay (rugosa) are my star performers with no disease at all. Graham Thomas gets the odd bit of black spot but is tough and healthy, same goes for Apricot Nectar. I am also growing Bonica on its own roots from cuttings and it is doing well even with our cruel sudden summer heat – we have had temperatures sore up to 45 but a few 40 and over days are common in summer, plus prolonged dry conditions and they just tough it out. Gosh, thank you, Adriana. That will keep me busy! I’m such a believer in planting plants that want to be there, so great to have a good starting point.